RAW-Blue™ ISG cells were designed for the detection of bioactive murine type I IFNs in a physiologically relevant cell line. RAW-Blue™ ISG cells were derived from the murine RAW 264.7 macrophage cell line by stable integration of an interferon regulatory factor (IRF)-inducible secreted embryonic alkaline phosphatase (SEAP) reporter construct. The levels of IRF-induced SEAP in the cell culture supernatant are readily assessed with QUANTI-Blue™, a SEAP detection reagent. RAW-Blue™ ISG cells are responsive to murine IFN-α and IFN-β but do not respond to their human counterparts. They are also responsive to PRR ligands that trigger the IFN signaling pathway, such as transfected double-stranded nucleic acids. RAW-Blue™ cells were incubated with increasing concentrations of mouse or human recombinant IFN-α or IFN-β, poly(dA:dT)/LyoVec or poly(dG:dC)/LyoVec. After 24h incubation the levels of IRF-induced SEAP were determined using QUANTI-Blue™. Growth medium: DMEM medium, 2 mM L-glutamine, 10% FBS supplemented with 100 µg/ml Normocin™ and 200 µg/ml Zeocin™. Activity of RAW-Blue™ ISG cells was tested with murine interferon alpha (mIFN-α), murine interferon beta (mIFN-β) and pathogen-associated molecular patterns (PAMPs), such as Poly(I:C). RAW-Blue™ ISG cells are guaranteed mycoplasma-free. RAW-Blue™ ISG cells allow the detection of bioactive murine type I IFNs or PAMPs by monitoring the activation of the interferon regulatory factor (IRF) pathway. These cells are derived from the RAW 264.7 macrophages. 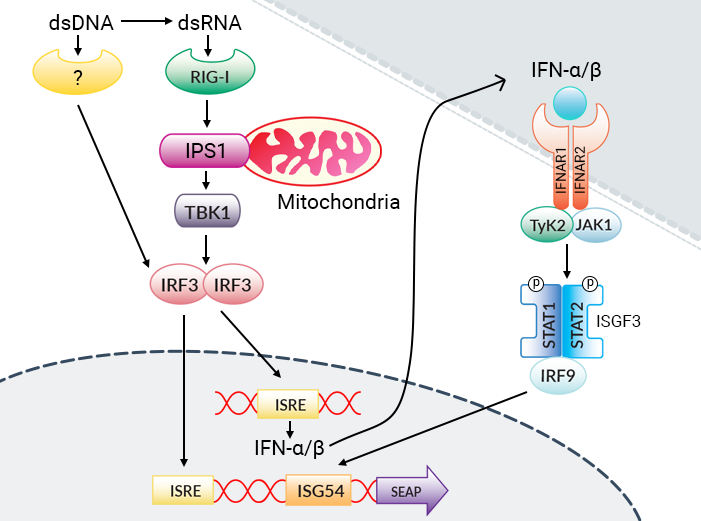 RAW-Blue™ ISG cells stably express a secreted embryonic alkaline phosphatase (SEAP) gene under the control of the interferon-stimulated gene 54 (ISG54)-inducible promoter enhanced by a multimeric IFN-stimulated response elements (ISRE). Stimulation of RAW-Blue™ ISG cells with mIFN-α or mIFN-β, or type I IFN inducers, such as tranfected poly(dA:dT) or 5’ppp-dsRNA, can activate the IRF3, 7 or 9 pathways and trigger the subsequent production of SEAP. Levels of SEAP in the supernatant can be easily determined with QUANTI-Blue™, a medium that turns purple/blue in the presence of SEAP and by reading the OD at 655 nm. RAW-Blue™ ISG cells are resistant to Zeocin™. Proteomic analysis of RAW macrophages treated with cGAMP or c-di-GMP reveals differentially activated cellular pathways. Aflaki Sooreshjani M. et al. 2018 J Immunol Methods. DOI: 10.1016/j.jim.2018.06.007. Measuring type I interferon using reporter gene assays based on readily available cell lines. Rees PA. & Joel Lowy R.
A bacterial cyclic dinucleotide activates the cytosolic surveillance pathway and mediates innate resistance to tuberculosis. Dey B, Dey RJ, Cheung LS, Pokkali S, Guo H, Lee JH, Bishai WR.